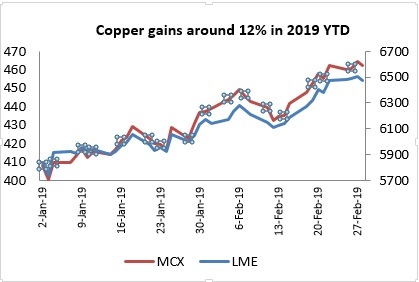 The year 2019 has started on a promising note for the red metal, Copper, with gains of around 11 percent on the LME and over 13.5 percent on the MCX in the first two months of 2019. 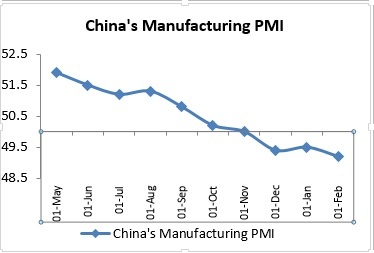 The prime reason for this momentum has been the ease of tensions between US and China. 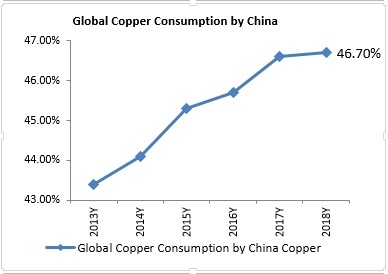 Adding to this, supply disruption in Chile, the top producing Copper nation and relatively tight spot markets in China led to further momentum. Let us understand in detail what led to this momentum in the leader metal. The trade war remains the major factor behind driving the base metal prices. The trade spat between US and China had dampened the global growth prospects as they are the biggest economies in the world. US President, Trump had vowed to increase tariffs on $200 billion worth of Chinese imports to 25 percent from 10 percent currently if the two sides cannot reach a deal by March 01, 2019. These two nations have been at loggerheads over trade and tariff issues for most of 2018 which resulted in drastic fall in metal prices. However, situations seems to have changed at present with Trump expressing his optimism about reaching a deal with China over trade issues. Falling inventories on the LME has been a boon to Doctor Copper prices in 2019. LME Copper inventory at present stood at around 21600 tonnes, the lowest since 2005. Most of this metal has been consumed by China and this is clearly visible in the imports by China. China imported a record amount of refined copper last year, 3.75 million tonnes, and the country’s appetite showed no signs of diminishing in January. This isn’t particularly surprising given last year’s strong global copper mine performance and several smelter outages which have freed up material for Chinese buyers. Moreover, China’s economy grew at a pace of 6.6 percent in 2018 which is much lower than expected by the government confirming signs of slowdown in the world’s biggest metal consumer, China. The PBOC was in action witnessing the slowdown in its economy and in order to get their economy back on track, they planned to inject liquidity in their economy by injecting cash in the system. The People’s Bank of China (PBOC) injected 250 billion yuan ($37 billion) through seven-day reverse bond repurchase agreements and 150 billion yuan through 28-day reverse repos. The US Federal Reserve in its meeting scheduled on 28-29th January 2019 promised to be “patient” in the rate moves due to impending slowdown and uncertain trade backdrop which boosted markets sentiments for risk assets further. The FED hiked rates four times in 2018 which had a severe impact on the global economy. Therefore, US Federal Reserve’s Chair Jerome Powell stated that considering the global economic conditions he has planned to halt their monetary tightening policy and decided to keep the rates unchanged. However, Powell stated that considering the strong growth in US economy FED might hike rates once in 2019 which might push the Dollar higher and make metals expensive for other currency holders. The easing of tensions between two biggest Commodities consumers i.e the US and China, US Federal Reserve’s dovish stance on interest rates and low inventories on the LME will be the driving factor for Copper prices in the near term. A note of caution for longs in Copper as the optimism over trade tensions have already led to rising copper prices and are currently trading at 2019 highs facing stiff resistance. Any move from here would be catapulted by how the dollar index as well as rupee behaves. We expect Copper prices on the MCX to move higher towards Rs.475/kg mark and from thereon it might correct lower towards Rs.455/kg mark in a month time frame. The author is Chief Analyst – Non- Agri Commodities & Currencies at Angel Broking Ltd.